For Lady Victoria Aguiyi Ironsi, the shock of the news of the tragic death of her husband, the late former Head of State, Lt. General Johnson Aguiyi Ironsi can never go away. She described the day and entire period as shocking and terrible dark days. But she remains grateful to God that she weathered it all. 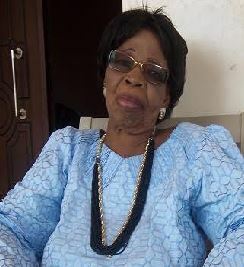 In this interview in Umuahia, Lady Aguiyi Ironsi laments that both the Federal and State Government do not accord the nation’s heroes the respect they deserve. Shocking, it was a terrible thing. But usually when a soldier marries a woman, he always tries to bring her up to his standard, that is to be brave and courageous. Time without number, they go out and they don’t return. They tell us as wives, ‘as a soldier, I can die any day.’ They don’t hesitate to tell us something like that. And when they tell us things like that, we always think they are just talking, but they are teaching us something serious, really. In my case, when I got worried, he would advise me not to be worried. He would tell me, ‘don’t be worried, I am a soldier, I can die any day.’ So on this fateful day, it happened. Where did he go to, a meeting in Ibadan; Fajuyi was hosting him at the State House, Ibadan. From a meeting you don’t see your husband again; he was not sick, nothing. What you do, nothing, you wouldn’t even know what to do, you are just empty. It is only God that can console you, that time you need God most. That was what happened to me, it was shocking. You don’t even know the true situation of things. Nobody told me whether he was dead or alive. For so many months, no information on whether he was killed. People just kept trooping in [to the State House], saying this and saying that, then you are dumb, you can’t even talk. I just kept looking at thousands of people that came to see me. Who were you going to talk to? Some people said they saw him in Umuahia, his home town, some said they saw him in other places, I was just looking at people talking, I did not know what to contribute. I was just confused, looking at them.